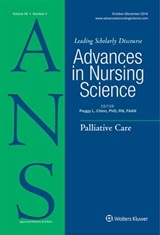 For this issue of ANS we seek manuscripts that focus on nursing perspectives related to specific health behavior patterns (for example fear, hope, despair, uncertainty, inner strength). Manuscripts can be based on empiric evidence related to these patterns as factors in health and illness, conceptual and theoretic developments, or philosophic perspectives grounded in nursing. We particularly welcome articles that provide direction for the development of nursing practice. Be sure to visit the ANS web site to see our planned issue topics, information for authors, and access to all articles published in ANS since the very first issue in 1978!